Fighting dogs are used dog fighting game as one of recreation of people. In Japan, the recreation is held in Kochi and Akita. The dog which is used dog fighting game is mainly Mastiff species. But the past, the dog of Spitz species was used. Fighting dogs are two varieties Tosaken and Akitaken. 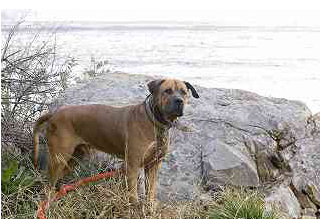 Tosaken is crossbred of Shikokuken, Bull terrier, Maedaken, Great dane, Old English Mastiff and Bulldog. Tosaken is a Japan’s dog which is popular as fighting dogs. The dog which was used as fighting dogs at the first is a dog of Shikoku. The last part of the Edo period, Tosaken was made and was mixed with various European breed of dog. So, in Meiji period, moreover, strong fighting dogs were made. Tosaken is tolerant and friendly. Tosaken has heart of attack. Its life is 10~12 years. Tosaken is large-sized. Its quality of hair is coarse and short. Its physique is muscularity. The skin is slack because it is bit. Its weight is about 90~91 kg. Color is red, apricot, black, forn and burindol. Tosaken and Akitaken’s withers heights are similar. It is about 60 cm. Tosaken’s weight is bigger than Akitaken’s. Tosaken is about 90 kg. Akitaken is about 54 kg. Tosaken and Akitaken’s life are similar. It is about 10~12 years. Now, Tosaken distribute each place of Japan. But in the early Showa period, it was found in Tosa of Kochi. Originally the Tosaken improved a Japanese dog used for hunting in mountains of Kochi as the world strongest dogfight became the biggest Japanese dog. The blood relationships such as a bulldog, a pointer, a mastiff, the Great Dane are introduced by a process of the improvement. It is only male dog to appear in the ring and divide it into the class every weight and face. Tosaken is usually quiet dog, but becomes the dangerous dog depending on discipline. Tosaken fights in backyard of house or the vacant land, then Tosaken misunderstand fight at all time and anyplace. Such Tosaken became nervous character that cautious on everyday take a walk. Then Tosaken may bite the thing which broke out to face by mistake. Therefore it is importance that Tosaken discipline to fight in sumo ring. Tosaken center in Katsurahama of Kochi holds fights between Tosakens. In the Tosaken center direct Tosaken where common man can’t enter division cage look and prepare for issue certificate of attestation that natural monument of Kochi. You can encounter Tosaken if I go to the Tosaken center of Katsurahama. Tosaken is looks fearful and storong, so tosaken is used of fighting dogs. Its weight is about 90~91 kg!This fact was suprised for me. Because Tosaken is heaver than me. Tosaken is usually quiet dog, but becomes the dangerous dog depending on discipline. So,I thought Tosaken is fearful,but brawny dogs. I find Tosaken what kind of dog. I went to the Tosaken center of Katsurahama. I don’t know Tosaken was made and was mixed with various European breed of dog. I hope to look Tosaken. So I want to go Tosaken center of Katsurahama. Fighting dog is Tosaken very cool. I want to go Tosaken center of Katsurashima. I want to go Tosaken center of Katsurahama and see Tosaken. I am interesting that Tsaken. I want to see Tosaken Battle. I live in Kochi,so I see Tosaken when I child.But I not understand about it. Fighting dogs are two varieties Tosaken and Akitaken,it is unexpected.I want to see Tosaken again. strong . So I think that I want to see dog fighting game of Tosaken and Akitaken. I surprised tosaken is big. I want to have tosaken. I am interested in Tosaken. Tosaken is very heavy and so big. Iwill want to know Tosaken. But I never saw combat. I want to go Tosaken center of Katsurahama. I didn’t know that Tosaken is fighting dog. Surprised! Usually Tosaken is obedient dog. I want to go to see it in Tosaken center. I read this report and understood many of Tosa dogs well. I have not watched a dogfight. So, I think to watch it if there is an opportunity. I like dog. But I don’t like Tosaken well of dogs. But I read article and become been interested Tosaken. I want to go dog fighting game. I am surprised at the weight. I want to go tosaken center. I surprised their weight. it’s neary 100kg! I have not seen Tosaken. I want to see Tosaken once time. I want to keep Tosaken. I want to raise Tosaken splendidly. thought I thought Tosaken is very fierce, I surprised they are tolerant and friendly. I want to go to the Tosaken center of Katsurahama. I didn’t know Tosaken do hunting in mountain. I want to go KAtsurahama to see them.